A more secure way to hold your phone or tablet, and also doubles as a desktop phone display stand! 3-M reusable gel pad on the polycarbonate plate adheres securely to all smartphones and mobile devices. 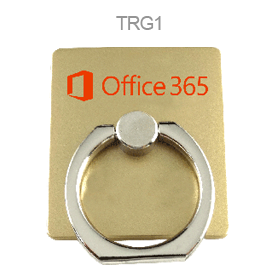 The ring rotates 360 degrees and swivels 180 degrees to allow a vertical or horizontal phone display. 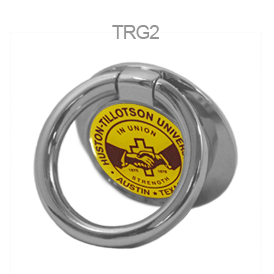 TRG2 is a jewelry quality ring with a full color domed decal. 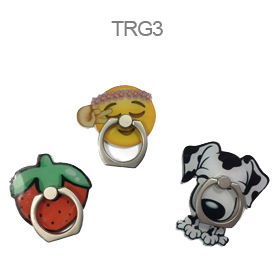 TRG1 has 1 color screened imprint. Imprint size is 1-1/8"W x 1-1/4"H with 1-1/8" x 3/8" area to avoid in the middle. 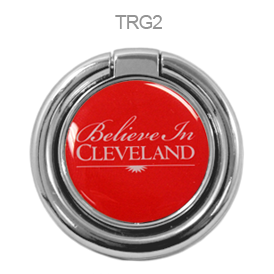 TRG2 has a full color domed decal 7/8" diameter. Size: TRG1 is 1-3/8"W x 1-1/2"H. Ring interior diameter is 7/8". TRG2 is 1-1/4" with a 7/8" imprint area. TRG1 Colors are silver, gray, and gold. 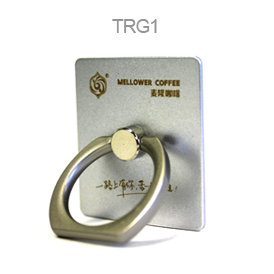 TRG2 is silver tone metal. 3 weeks from approval of artwork. Shipping weight approximately 10 lbs per 100 pieces. 36.00 (G) plus set-up charge. Adds 2 weeks.